A SECOND PENTECOST: IS THERE THE HOPE OF AN END-TIME REPEAT OF PENTECOST?! 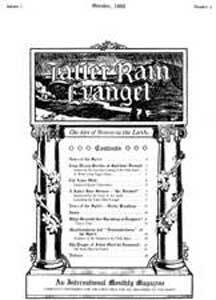 The Latter Rain Evangel (LRE)5 was published monthly by the Stone Church, the significant early Pentecostal congregation in Chicago founded by William Hamner Piper.6 The Stone Church hosted the second General Council of the Assemblies of God in November 1914 as well as the 1919 General Council. Latter-Rain was an allegorical/symbolic and a new template for the church age derived from the early and latter rains of the growing season in Palestine. These early rains were for planting barley and then, after a long period of no rain, the latter rains came and filled out the barley and prepared it for the end of season harvest. This simple reference to the seasonal rains of Palestine was lifted from its Old Testament context during the last years of the 1800s and pressed into service as an allegory and paradigm for the history of the church age. This of course is an illegitimate way to handle scripture. But it was used nevertheless. The early Palestinian rains were symbolized by the first Pentecost and the latter rains were seen as a Second Pentecost just prior to the end time harvest of souls and the return of Christ. However, this original Latter Rain “Second Pentecost” teaching was put on hold for a number of years. It was left for the “New Order of the LatterRain” (NOLR) in Canada 50 years later to reclaim this historical paradigm of the church age which effectually repudiated the premillennial teaching of the previous years. George Warnock, a Latter Rain worker while still in Canada during the mid-century Latter Rain “revival,” wrote a systematic New Order of the Latter Rain theology. His book is called The Feast of Tabernacles.10 This is actually another symbolic allegorical presentation. Warnock summarized this theology as Passover, Pentecost and a (now to be fulfilled) Feast of Tabernacles to typify the whole church age. Beginning with the Feast of Passover, representing the death of Jesus, the Feast of Pentecost typified the birth of the church, and the future Feast of Tabernacles points to the so-called Latter Rain “Second Pentecost” at the close of the church age. But once again, in the 1950s, many Pentecostal believers rebelled at this obvious false teaching. 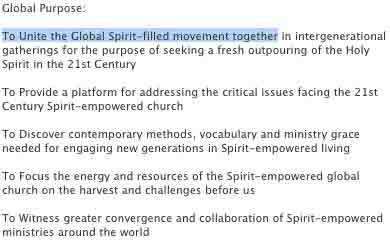 The Assemblies of God met and repudiated the NOLR in the ‘50s. Also, about this time, William Branham, who initiated this Latter-Rain by his impartation with his laying on hands, died suddenly in a car accident. Books could be written of the many weird and bizarre teachings, and obvious clairvoyant ministry, of William Branham. (You’ll find a number of these teachings by this false prophet listed here: http://www.letusreason.org/Latrain4.htm, accessed 5/19/14. This event caused the Latter Rain teaching to apparently fail in the mid ‘50s. It in effect went underground. Oh! It would never be called the Latter Rain. But Prophetess Cindy Jacobs and Bill Johnson are Latter Rain pure and simple, but operating with a re-branded version of a “Second Pentecost.” Bill Johnson’s book When Heaven Invades Earth is Latter-Rain in essence.11 But who today knows what the Latter-Rain is or was? This includes most Pentecostal pastors. But there are those who use the Latter Rain playbook, and like NFL coaches on the sidelines, hide the playbook from prying eyes.